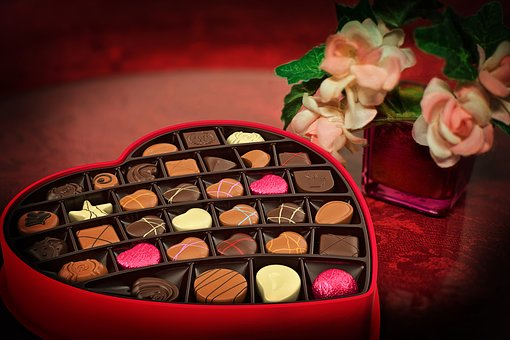 Cards, gifts, candy, flowers, dinner, wine, jewelry, romance, love – that's what Valentine's Day is all about, right? Well, it hasn't always been that way, and may not really be now, at bottom. The fact is . . . Valentine's Day has its ancient origins in debauchery and blood moving toward sappy sentimentalism in the Middle Ages and Renaissance and beyond to today's crass commercialism. But you just may be able to capture the true spirit of Valentine's Day with the sweet and tender Portuguese tradition of sweetheart handkerchiefs. The ancient pagan festival from which Valentine's Day ultimately stemmed didn't have much to do with chubby winged cupids and candy hearts. It was, rather, dark, bloody, and filled with ebauchery. Although the exact origin remains hazy in the mists of time, most scholars believe that it can be traced back to the ancient Roman Lupercalia, "where men hit on women by, well, hitting them" (NPR). dog and a goat and then proceeded to whip the women participants, often desirable maidens, with the hides of the sacrificed animals as way to enhance their fertility. The young women lined up to receive their hide whippings because they desired fertility. The romantic Roman whippers, according University of Colorado at Boulder historian Noel Lenski, were usually drunk and naked. This romantic Roman fertility party usually included a kind of matchmaking lottery. The young men would draw names of the young women from a jar, and then each couple thus paired up would couple "for the duration of the festival – or longer, if the match was right" (NPR). Then along came a couple of martyrdoms and Christian attempts to appropriate and baptize this holiday. Under Emperor Claudius II, two men named Valentine were executed on February 14, but in different years in the third century. The Church honored these martyrs and established a feast day – St. Valentines Day. But then in the fifth century Pope Gelasius I muddied the waters by combining St. Valentine's Day with Lupercalia to appropriate and Christianize the pagan festival. Lupercalia then become more of a theatrical interpretation of what it had once been, with less drunkenness and more clothes worn. Still, St. Valentine's Day/Lupercalia remained a time to celebrate love and fertility. As time wore on, the holiday grew sweeter, moving away from fertility to an emphasis on romance. Both Chaucer and Shakespeare romanticized the day in their works, and as a result it grew in popularity in Britain and throughout the rest of Europe. During the Middle Ages, handmade paper cards became the favored Valentine's tokens. As the Middle Ages resolved into the Renaissance, the Lupercalian tradition of drawing names saw a recrudescence. Boys and girls drew names and were "supposed to devote themselves to the person they drew for the day. If a boy and a girl mutually drew each other's names, that was considered an omen that they would marry. There was also a belief that the first person of the opposite you saw on Valentine' Day would become your valentine (excluding family members!)" (L.M. Elliott). Giving Valentine's gifts was a prominent aspect of the holiday at this time as well, just as it is today. "No matter how you picked your Valentine day partner, you were expected to present him or her with a token: a piece of jewelry, gloves, sweets, or something shaped like a heart or the Valentine partner’s initial. Men often gave their ladies a heart-shaped emblem she could wear on her sleeve—which is where we got the colloquialism 'wearing your heart on your sleeve'" (L.M. Elliott). Eventually, these Valentine traditions made their way to the New World and took on slightly altered but still recognizable forms. With the advent of the Industrial Revolution, factory-made cards became big as Valentine's tokens. It was in 1913 that Hallmark Cards began the mass production the kind of Valentine's cards that we know today. Now, Valentine's Day is big business, which has spoiled it for many . . .
"Valentine's Day in 2019 looks very different than it did a decade ago. Ten years ago, more than 60 percent of adults planned to celebrate Valentine's Day; today, that's dropped to just over half. At the same time, spending for the holiday has continued to rise and is projected to reach more than $20 billion this year" (National Retail Federation). Although the numbers of people celebrating Valentine's Day are declining, those who do participate are spending more – but the emphasis is shifting. "Between 2009 and 2019, the average amount consumers planned to spend on Valentine's Day gifts increased by $60. While gifts for a significant other are still an important part of the holiday, much of the increase is being driven by gifts for other loved ones. Today, Valentine's Day is about sharing the love with everyone – from gifts for friends and family to cards for co-workers and children's classmates and, of course, special treats for pets. Some of these gifts will take the form of more traditional items . . . but consumers are also looking to give a special experience" (National Retail Federation). Let's see, then, how we can turn this around with an old Portuguese tradition – a gift that is at the same time a "special experience." This old tradition from northern Portugal captures and keeps alive what we think of as the true spirit of Valentine's Day. It is the tradition of sweetheart or fiance handkerchiefs, in Portuguese lencos de pedidos or lencos dos namorados, which reached its peak in popularity in the seventeenth and centuries. These tokens of love and affection first became popular among the nobility and were later adopted by the general population. They later became loosely associated with Valentine's Day. These were specially embroidered cotton or linen handkerchiefs given by young single women to their sweethearts, usually when the young men went off to sea or to war in the former colonies. The handkerchiefs, as pledges of love, were embroidered with coded symbols. For example, a heart represented love, a lily signified virginity, a pair of doves symbolized a couple in love, and a red carnation expressed a provocative, flirtatious message. Originating in the Minho province of northwestern Portugal, sweetheart handkerchiefs were first used among the nobility as a kind of marriage proposal. Later, after adoption by the general populace, the scope was broadened, and they became a way to initiate "dating" and kick off a relationship. Girls learned the art of embroidery at an early age and later used these skills to show "admiration" for their sweethearts. The young men thus favored would wear their handkerchiefs in public as a sign to the world (and other young ladies) that they were in a committed relationship. The designs and love-inspired motifs on the handkerchiefs included, of course, birds, flowers, and hearts, as well as verses from love poems. "The Valentine handkerchiefs or request handkerchiefs were, according to Minho tradition, handkerchiefs that were embroidered with the care that the beating heart put into the hands of girls at the dating age. The girl would embroider her handkerchief from a fine linen cloth made by herself or from a cotton handkerchief purchased at the market. After the embroidery, the handkerchief would reach the hands of the selected one, and it was the fact of him wearing it in public or not that would decide the beginning of the love affair. The handkerchiefs were associated with happy love stories . . . overwhelming passions, or simple momentary flares, portrayed in the polychromatic designs embroidered on the whiteness of the linen" (Namorar Portugal). Today, the tradition and craft of creating sweetheart handkerchiefs has become more a handicraft rather than a romantic phenomenon. In fact, there are now committees that oversee the production of such handkerchiefs. The handkerchiefs, evaluated by a committee, have to meet strict criteria with respect to size, colors, thread count, and motifs. Having met the criteria, a handkerchief is certified as an approved handicraft product. Still, this is a lovely tradition. And it would be a great way to inject an element of true romance back into Valentine's Day. If you'd like to get in on the tradition and the romance of a sweetheart handkerchief for your Valentine's sweetheart, Wholesale For Everyone has you covered. We have a great selection of quality handkerchiefs, and we offer custom printing and embroidering. With our custom 4-color screen printing and embroidering, you can personalize our designs with your own text, logo, or image. You can choose from among our stock images or let us transform your ideas into wearable Valentine's art. Create your own sweetheart handkerchiefs with our help . . . and step into an old tradition of true romance.